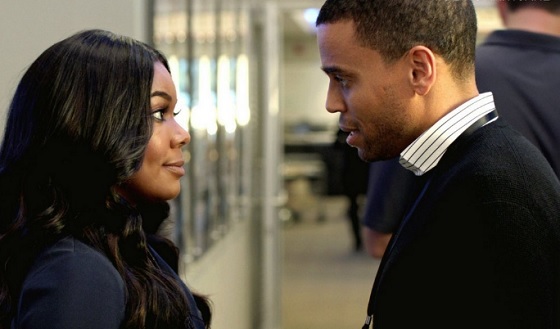 This season of Being Mary Jane is really looking to be one of growth for our girl MJ! Picking up from last week, MJ pitches a story idea about a kid in New Jersey, Calhoun Jeffries who was wearing a kilt out and about. His dad sees him, and smacks him around for it, eventually dragging him away, which sparks a conversation online about fashion statements like this and acceptance in the black community. Does it really determine gender or sexual identity, or is it just fashion...and was the dad in the wrong or was he just trying to protect his kid? Surprise, surprise — both Justin and Ronda think that the story is a family matter, not news. These two are determined to block Mary Jane at every turn. Ronda's clearly in lion mode over her job, feeling threatened by MJ, but what in the world is Justin's deal? We still haven't figured out what exactly his issue with Mary Jane is. MJ records a short piece about the story anyway as the new web correspondent, and posts it online. After it gains two million views, Garrett decides to let Mary Jane run with the story for the actual show, since she got ahead of it before it really picked up. Later, Mary Jane tries to approach Calhoun at his house, knocking consistently and even sitting outside waiting on him. She eventually gives up, and heads to dinner to Kara's with Lee and PJ. Kara is happy to see Mary Jane with Lee, but isn't looking for anything serious with Orlando herself, especially since she's focused on work and her kids. Kara wants to have fun, but isn't too impressed with the boy's bedroom skills. Throughout the episode, she's honest with him about it and tries to work on his technique, thinking it'll be fun for him to learn. Of course, he's a little offended at first, but they keep working at it. Meanwhile, Mary Jane does more research on Calhoun's fashion idols while she hangs out with Lee. When he mentions that he has a kilt himself, Mary Jane's eyebrows automatically raise. They have a conversation about Lee's metrosexual ways — his style, his constantly drinking tea, and even the way he crosses his legs. It really is probably just the English culture, but it's intriguing that MJ would be put off by Lee's ways, when she's intensely working on a story on a boy who's judged for his fashion as well...even by his own father. Kara calls out Justin for always trying to shut down MJ's ideas and work. Justin dismisses her claims, saying that he works harder and is just more dedicated than everyone else...including Kara. He even has the nerve to say that he's able to commit more than she does because she has kids, but Kara tells him that her intelligence and MJ's talent is what makes them work so well as a team. Clearly, Justin cares nothing about that. Later, Ronda and Justin again voice their concerns to Mary Jane about bringing D Razor on. Justin sees this entire story as a father protecting his son in the black community. Neither of them want to to say anything to Garrett though, so MJ continues on about her business. She interviews D Razor, and he expresses that he is more open minded, along with a good majority of today's youth. He says openly that they need to make sure incidents like this don't happen again, calling out Calhoun's dad for his actions towards his son. Mary Jane is later able to finally meet Calhoun, who is first suspicious as to why she or anyone else should even care about this story. His dress doesn't automatically make him gay, which is what MJ assumed. Calhoun rejects the idea to come on the show, until his father comes out there and starts going off on MJ, telling her to leave. From his perspective, Mr. Jeffries is trying to "protect" his son in the black community and from being a media spectacle. It's that thinking though, that is detrimental...that Calhoun needs to be "normal" and fit in with those around him. At that moment, Calhoun decides he's going on the show, and stands toe to toe with his father, willing to fight him if need be. Like that makes him more of a man in his father's eyes. Apparently, it did in some way, because Mr. Jefferies backs down. Later on, that bedroom training may have been a little too good between Kara and Orlando. He ends up doing something to his neck, and has to miss the start of spring training! Garrett asks Kara what happened, which she obviously has to play off. Even in his neck brace, Orlando comes over to see Kara, just wanting to hang out, and you can tell that she's not totally feeling it. He might just end up wanting more out of their relationship, and Kara clearly doesn't. At the end of the episode, Calhoun comes on the show and opens up to Mary Jane about his style. Though he admits that he's bullied a lot, his supporters far outweigh the haters, and he's glad about that. It was definitely a good discussion starter, which is what I love about this show from the very beginning! Lee's impressed MJ's story, but she hasn't completely accepted Lee for his own style yet, seeing it as a lack of swagger. I swear, sometimes I want to slap this girl upside the head and she's not even real! Mary Jane is working on it though, and wants to be with Lee still. I just need her to stop looking for reasons or excuses to back away from him...he's a good dude and good for HER! 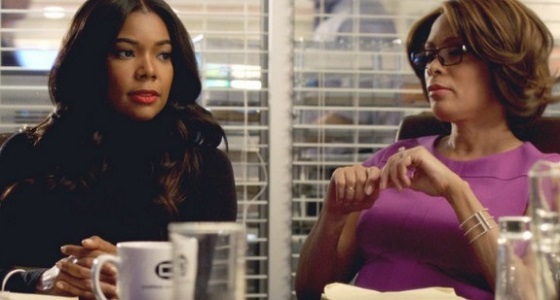 Let us know what you thought of this episode and check out all new episodes of Being Mary Jane on Tuesdays at 10 p.m. ET only on BET!